There was a discussion on the Facebook Wisbech Discussion Forum the other day about the legendary “big cats” that supposedly haunt the English countryside. My wife followed the debate and drew this. I think it’s pretty neat, so I am posting it here. Quite a crazy weekend! On Friday I was the volunteer DJ at the Kid’s Halloween Party organised by We Are Wisbech as part of the Horsefair Halloween Activities. I do this every year and always enjoy it very much. The families seemed to have a nice time and the Institute looked fantastic all decorated in spooky dressings. I went straight from my volunteer DJ gig to a commercial one in Wimblington. I spent most of Saturday chasing up new issues that residents of Medworth have raised with me, plus a couple of new ones in Peckover, but in the afternoon I had to buy and wrap presents for a spooky “lucky dip” as part of Saturday Night’s Conservative Halloween Party. The night was also great fun, but it didn’t end quite where I’d expected. On the way home I was witness to an incident and ended up at the Police Station until 3AM giving a witness statement. Can’t say any more than that, since it may potentially go to court. On Sunday I had a rare day of and spent it with my family. We have a Halloween tradition of a Chinese Meal and a Scary Movie and that’s what we did. My Son spends most of his time asking us to cover his eyes! I’m sure I was the same at Nine when watching those old black and white horrors with my parents. When I looked around my current house way back in early 2002 I literally fell in love with it immediately. I made an offer on the spot and a few short months later my girlfriend and I moved in. Since then I got married and we had a Son who is now nine years old. But things change and people change and the time comes to do something different. I’ve been mulling this over for a few months. I’ve discussed it at length with my wife, members of my family and close friends. The time has come. As of today my house and my shop, numbers five and six Alexandra Road, are on the market. My family have loved living in this house and we will miss it terribly, but our situation has changed and it is time to reflect that. So if you’re looking for a fantastic, unusual, tardis-like home with a neat little shop on the side, give me a call. While we don’t mind taking a bit of time to get the right buyer, a quick sale would also suit us. We’re excited, you see. Now we’ve decided what we’re doing we’re ready for the next adventure. This blog (in its various forms) has now been around since September 2007. Six full years. As blogs go, that’s not insignificant longevity. So I thought, for its Sixth birthday celebration, I might write some kind of summary, or “long view” type piece. And then I thought it might just be nice to do a gallery of pictures dating back six years. After all, a picture is worth a thousand words. So this post is going to be the War & Peace of blogs! The pictures presented here are mostly just personal stuff I’ve been involved in, but they have all been published on this blog at some point. They’re not presented for any reason other than my own amusement. But they are (very very loosely) in linear order, with the newest at the top and the oldest at the bottom. Some of the faces are no longer with us and I miss them. This represents a period worth about a seventh of my life. Probably the best period of my life, actually. So thank you, Wisbech. And thank you all the people in these photos and anyone who knows them. Without further ado, I give you – six years of Getting The Message Out / Steve Tierney’s Soap Box. Six years of my life. Me with Robert Scrimshaw R.I.P. Tonight the Cambridge Conservative gang are returning to Fenland for a curry with the Wisbech Conservatives. This has become a regular event, with us visiting them and then them visiting us. It’s always fun and it’s a good way to build and maintain connections with friends and colleagues across Cambridgeshire. This Saturday, my wife is off to a “Forties Weekend” – leaving my son and I to tear up the town. Well, as much tearing up as you can do with an eight-year-old, anyway! We’ll be joining the Newton Street Pride team led by Sam Clark and Dee Markham in the morning, then going swimming and catching a movie. Sunday, I have nothing “official” to be doing, so I’ll probably catch up on the mountain of work that is steadily growing in my office. Plus, I really have to finish getting my shop ready to re-open. While I’m hear – I have a lot of old computer hardware, mostly in brand new condition and still boxed, which I need to get rid of. Does anybody need any bits and pieces? Let me know. It was my brother Dan’s birthday at the weekend and a chunk of our family zoomed off for a couple of night’s camping to celebrate. We didn’t go far, staying in a campsite about half an hour’s drive North of Peterborough, but it still had the feeling of quite a remote getaway. My wife didn’t come along (she’s not a big fan of camping) and so my Son and I shared a little tent which I purchased just for the trip. I was rather taken with the tent, which was one of these new “instant assembly” types. You take them out of their pack, shake them once, and they set themselves up without you needing to do anything. It’s like a magic trick. I felt like shouting “alakazam!” as I created a pleasant little tent with a flick of the wrist. The park was exceptionally cheesy (which is absolutely not a cricitism!) and as far as white knuckle rides go this ain’t no Alton Towers. But neither do you have to queue for two hours to get onto anything. In fact, a very enjoyable day can be had with all manner of different little attractions scattered about the site. As you enter the park the first thing you see is “Curtains Chaos” – which is a sort of cross between a Ghost Walk and a Maze. The picture above is one of the scary clowns that can be found lurking within. It turned out that the park has several of these interesting little spooky attractions including the excellent Farmhouse Of Fear and the claustrophic Dungeon. This sort of thing isn’t up everyone’s street, but personally I felt we’d got our money’s worth in cheese and old-fashioned fun within the first half hour – and at that point we’d barely seen a smidgen of the site. My son spent an hour on this. But don’t let the photo fool you. It’s was absolutely rammed with people – mostly kids – laughing and playing and rushing around blasting one another with water pistols. I would have had to drag Joe out screaming had there not been so many other fun things still to do. This is possibly the slowest and most un-thrilling roller-coaster in the world. You could take your grandma and your toddler on it and neither of them would bat an eyelid. That said, it rolls through some glorious countryside and on a hot day like last Saturday the pleasant breeze you get while riding it is well worth it. Oh, and you queue up for about thirty seconds to get on it. A bonus. The log flume had the longest queue in the park. It was about ten minutes. It’s kinda fun, if brief. It’s just about the only thing I wouldn’t revisit if I went back. It’s not that it’s bad – but they were only running two cars and the brief thrill wasn’t really worth the time it took to get it. 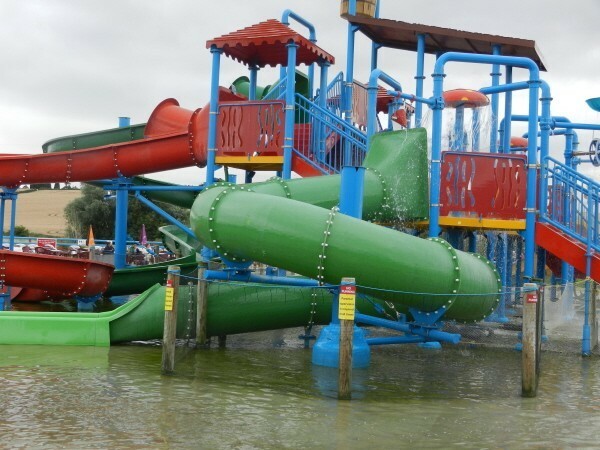 There were lots more rides, a fun farm with animals to view and pet, an indoor play area, a boating mini-lake, lots of giant slides, as well as numerous expansive play areas for the kids. Pretty much everything (except food and drink) is free after you pay for admission, meaning that the overall price for the family seems like quite a good deal by the tired footsore end of the day. My Brother Alan and I decided, at about 10PM on Saturday night, that we needed more crisps and chocolate, so we left the rest of the family sitting outside the tents drinking wine and went on a search for a late night garage. We got hopelessly lost. The SatNav was, apparently, haunted and it took us around and around in ever stranger and more remote circles. We finally gave up and returned just as everybody else was ready to turn in. Still, it’s not every day you get to see miles and miles of nothing. We were good-humoured about it. A suntan and a fun day with the family will do that. My Son slept like a log throughout the night. I did not fare as well. Foolishly, I had purchased an air bed, thinking it would aid in my comfort in the tent. I don’t know why I did this as I’ve never minded sleeping on the floor before. It was a mistake. The air bed gave me back- and neck-ache. Once I discarded it I slept better, but by then I was knackered. After breakfast some of the family took a walk in the countryside. My Son revisited the playground on the camp site which, while quite basic, did provide visitor’s kids with the perfect opportunity to do dangerous and unforeseen things with the play equipment out of sight of their parents. I went over a couple of times to check on him. The first time, all the kids were swinging as high as they could and then leaping off their swings to see who could land the furthest away. Packing up the tent was instructive. Apparently, these “instant tents” are a bit like every government. They give with one hand and take with the other. By which I mean that the time saved in that miraculous magical set-up, became a Krypton-factor style brainbuster of epic proportions when it came to putting the darn thing away again. Eventually, we gave up, leaving with it half-stuffed into its bag and rammed into the back of the car. I suspect that rather than use it again I may buy something more traditional, so if anybody wants my Hey Presto! Tent – just let me know. Free to a good home. “Because you are usually watching me,” He said. I’ve had an interesting sort of week, though it was mostly dominated by work. Since fifty or so hours a week of my time were recently freed up I’ve been working to rebuild and consolidate some of my various business interests. I closed Number10 Café last weekend and have been putting lots of extra hours into my other businesses. It’s beginning to pay off and it’s actually quite refreshing to get back to making some money again. I’ve also had quite a variety of interesting meetings this week. On Tuesday I had a meeting with a group in Leverington who had an interesting proposal they wanted some advice on. I won’t relay exactly what it was, since it’s their thing and not mine – so not my place to do so. But I thought it innovative and clever and I offered to help however I could. On Wednesday I was in Newton meeting with one of the parish councillors to finalise details of next week’s big summer fête. Today I met with one of the people on the list for selection as a Conservative MEP candidate (which reminds me, I really should do a fun run-down of the candidates sometimes soon. It’s been a while since I’ve done one of those!) Tomorrow I’m heading into Tydd St. Giles to share a pint with some of my friends there and chat over local planning and Fenrats business. I did manage to get back to the gym yesterday. I’ve had a six month hiatus from weight-lifting and I’m getting saggy and old, so it was time to try and reverse at least some of my decline. If such a thing is even possible. I popped over to Shapers, which is refreshingly unchanged from when I first went there a decade ago. It’s still the sort of blood-and-guts gym that scares the faint-hearted and spikes your adrenaline the minute you walk in the door. Very loud metal bands pound and roar out of the giant speakers while huge muscular chaps lift ridiculously large stacks of weights with seeming ease. Great atmosphere, tons of equipment, can’t ask for more really. Though everything is aching today – it’s good to be back on track. I intend to get back to four gym visits a week starting now. Oh, and I’ve joined the Village Hall Committee in Leverington too. That’s two village hall committees. I may possibly become an authority in village hall committees! :) But it’s a great way to help with local causes and broaden the choice of things local people have to do in their area. I don’t know what my meagre talents can add to the excellent committee there – but as ever, I’m glad to try and help. Also, I managed to get the front of my house painted and my front garden planted – and even managed to clear the back garden in time for some Summer barbecues. Presuming we ever get some Summer. Perhaps it’s more likely that all this Global Warming will deliver us Winter in early September and snow by late Autumn? Damn you, Carbon Dioxide, and your terrible heat-trapping properties. I notice that, having organised the protest in Wisbech via their activists and supporters (some of whom they later disowned), gained publicity from it for the local elections and trolled its message board for new members, UKIP decided to advise their members not to attend. Good of them, that. I chose to get out of town the weekend of the hater’s gathering protest march and spend some time with my family somewhere quiet. We headed out towards Great Yarmouth and stayed in a little village near Caister, in a small chalet in a campsite. It was a very pleasant weekend despite the lack of Summer showing more than a glimpse of its face. We walked on the beach, jumped on the dunes, went swimming, played in the penny arcades and enjoyed ourselves in the Pontins-style clubhouse with the sixties cover band and the dodgy puppeteer. Much like I remember doing when I was a kid, actually. It’s not gotten any less awesome since then. I guess my family and I have simple tastes. Nothing wrong with that! My son Joe, relaxing after some rock-jumping. Look how close the pink jewel is to dropping! Health and safety be damned. Boys want to climb. Joe holding up the ocean. My vacation already seems like it happened about a thousand years ago. That’s the nature of them, I suppose. A brief escape from the everyday trials and worries, quickly gone. But at least it’s been quite easy to get back into the routine. I had my two surgeries; Gorefield and Peckover, last Saturday. On Saturday night I was quizmaster for a Conservative fundraiser. 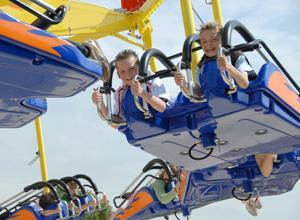 On Sunday I took my son to the Funfarm in Spalding and then caught up on paperwork in the evening. This week there is all sorts to do. Tonight I’m at a Street Pride committee meeting and tomorrow I’m in London in the morning for a business meeting and then rushing back to meet some constituents in the afternoon. Early evening i’ll be in South Holland, attending the South Holland District Council planning committee meeting which will hear the other half of the wind farm plan that we already beat in Fenland. Fingers crossed. On Thursday i’m at Shire Hall all day for a series of meetings related to my cabinet portfolio including the Public Health Infrastructure Steering Group, The Public Health Management Team and then two different one-to-ones with lead officers on different issues. On Thursday evening I’m meeting the Fenrats for a celebration of our previous win against the windfarm proposals, a chat about the outcome at South Holland (whatever that may be) and plans for the future just in case this particular bogeyman makes some sort of unpleasant comeback. On Friday I’m back to Shire Hall again for a meeting of the Health & Wellbeing Support Group, and then a progress report for the Wisbech 2020 project. After I leave Shire Hall I’ll be meeting other members of the team supporting our PCC candidate John Pye to discuss the campaign. On Saturday I’m taking my son camping for a single night, because we do this once a year. I’m hoping the weather holds up! And finally, on Sunday, I have a Leverington Street Pride litter pick in the morning and a meeting with constituents in another village in the afternoon. As you can see – back into the swing of things! Generally, I do my best to give a factual (ish) answer and let him decide. But to be honest, I know I don’t really do this very well. It’s hard to portray something that you think is barking mad as logical in order to protect some elusive goal of parental responsibility. “Maybe he can’t afford as many toys,” I said. “Maybe he doesn’t have parents. Or maybe his parents can’t afford toys either,” I said. “That’s absolutely fine by me,” I agreed. *My answer to the question: “What do the Purple Team do?” is usually – much the same as the Blue Team, but more angrily. *My answer to the question: “What do the Yellow Team do?” is usually – talk a lot and disagree with everything the Blue Team say.